Featuring Six Sing-Alongs, Two New Animated Shorts, and Four Fun Activities! The DVD is jam-packed with fun extras including a new animated short "Elefun and Friends," the "Waiting for the Winter Wishes Festival" prequel, six sing-along songs, downloadable coloring sheets, cut-out pony ornaments and four fun activities. 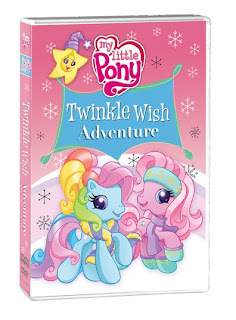 My Little Pony: Twinkle Wish Adventure is priced at $14.99 SRP. I've loved My Little Pony since I was a girl and when they brought this delightful toy back, I was thrilled because my girls could play with them! My daughter and I enjoyed watching this movie. I love My Little Ponies - their stories always warm my heart! One of you will win a copy of this DVD all for yourself! To enter, tell me who you'd like to win this DVD for. my dd Christina, of course!!! I would give this to my nieces for Christmas! My 3-year-old daughter would love this! I would like to win this for a Christmas present for my daughter. I want to win this for my 6 year old! thanks! entered the make ahead meals giveaway! If I were to win, I would give this to my daughter as a Christmas present. I shared about this giveaway on my Facebook. I entered your giveaway Make Ahead Meals for Busy Moms. I would like to win Twinkle Wish Adventure for my daughters. #1 - I'm subscribed to your blog via email. #2 - I'm subscribed to your blog via email. #3 - I'm subscribed to your blog via email. #1 - I became a Fan of A Simple Kinda Life on Facebook (Deanna Devendorf McClellan). #2 - I became a Fan of A Simple Kinda Life on Facebook (Deanna Devendorf McClellan). I'm following your blog using Networked Blogs (Deanna Devendorf McClellan).